Globally, we are facing many significant environmental challenges, including climate change, pollution and waste. ESO — as the foremost intergovernmental astronomy organisation in the world — has a role to play: by addressing the environmental impact of its activities and operations; by ensuring it is well-informed in its decisions and actions; and by contributing to sustainable solutions towards a greener planet. ESO carries out the design, construction and operation of the most powerful ground-based observing facilities in the world, providing astronomers with the best tools to enable the most important scientific discoveries. But this work places significant demands on resources, including energy. Environmental awareness is therefore a core value for ESO. Many of the organisation’s Member States have established tough controls on pollution and waste, as well as signing new international regulations — such as the Paris agreement — with which ESO aims to bring its policy in line. By considering environmental awareness as a key tenet, new projects will also naturally incorporate green aspects from their initial stages. In the long term, costs can also be brought down and money can be saved. Several green initiatives have been developed in consultation with ESO staff, through which the organisation aims to tackle the environmental impacts of its operations. The current situation at many ESO sites is encouraging, but still fall below an ideal level. As such, several improvements are ongoing, with many future developments proposed. To ensure that all the main aspects of our activities, including operations, IT and resource management, are efficient and protective of the environment. To consider environmental stewardship and energy consumption as administrative parameters, as part of an overall strategy to increase operating efficiency. To maintain a public commitment to meaningful and achievable green goals. To promote energy conservation and environmental stewardship across all activities. To have a strategy that supports reducing costs, lowering complexity, and increasing operating and energy efficiency. To look for ways to improve IT operations to generate more computing performance without increasing power consumption. To develop verifiable energy conservation and renewable energy initiatives that proactively address energy and climate challenges. To pursue the development of energy and environmental strategies and policies. In order to implement these strategies, ESO will strive to endorse environmental friendliness as a core value at the highest level. It will also aim to draft an official environmental policy involving experts in the field. The ESO Headquarters comprises the scientific, technical and administrative centre of the organisation and thus is reliant on a high-quality IT infrastructure and, particularly for its academic work, high-powered computing. All computer rooms are equipped with efficient air circulation cooling devices of the newest standards and all old cooling units were recently replaced. During the winter months, the cold outside air is used to cool the computer rooms to reduce power consumption. All pumps in the heating system, as well as all control units of the ventilation system, have also been replaced with new models to save energy. ESO is committed to the separation of waste and recycling of glass, cardboard and paper, metals, plastics, electronic materials, domestic waste, batteries, fluorescent tubes, electronic waste, coffee cups, hazardous material, glass, copper and other metals and more. Environmentally friendly, wood-free printing paper is used. ESO supports Stadtradeln — a competition and campaign to support climate protection and promote cycling in Germany. The ESO sites are very geographically dispersed (ESO has more than a dozen small and large facilities and sites in Germany and Chile) and makes extensive use of video conferencing facilities to reduce travel and the consequent environmental damage. Likewise, ESO encourages astronomers to make use of “service mode observations” whenever feasible, eliminating the need for them to visit the observatories and thereby reducing carbon footprints. The energy consumption of both the new Headquarters Extension (eso1350) building and the new technical building is significantly lower than typical for buildings of their size. This is achieved by efficient insulation and state of the art heating and cooling concepts. Offices in the office building are cooled and heated by concrete core activation using a heat pump and groundwater supported by geothermally-generated district heat and are vented naturally. Geothermal heating is a sustainable energy source that uses the heat retained within the Earth. Below Garching, a source of hot thermal water (about 74 degrees Celsius) has been utilised that is pumped around the ESO headquarters to keep the temperature just right. Energie-Wende-Garching are the suppliers of this sustainable form of energy. Common areas (meeting rooms, auditorium, Council room and cafeteria) utilise a mechanical ventilation system with heat recovery. Floor-to-ceiling triple glazing in both buildings, as well as automatically operated blinds control the amount of sunlight into the rooms, meaning less heat in the summer and less heat loss in winter. Chillers with free cooling systems are being used for the technical building and the IT infrastructure and laboratories. Green measures were incorporated into the design of the ESO Supernova Planetarium & Visitor Centre. The facility received the DGNB (Deutsche Gesellschaft für Nachhaltiges Bauen or German Sustainable Building Council) Gold certification for sustainability with respect to its "green economical, socio-cultural, technical and ecological aspects". The remoteness of the Atacama Desert presents significant challenges to ESO’s operations at its ALMA and Paranal observing sites as food, water and other consumables have to be either produced on site or trucked in from nearby cities. Cerro Paranal and Cerro Armazones were connected to the Chilean national grid in 2017 (eso1716). This connection was made possible by the Chilean Government, and is managed by the Chilean Grupo SAESA. The connection reduces costs and provides greater reliability and stability, as well as reducing the observatory's carbon footprint as the grid electricity is produced with a lower percentage of fossil primary energy. Prior to the connection to the grid, power use has remained stable over the past few years at Paranal. While power saving has been a paramount objective at Paranal, the power requirements for the considerable amount of high-tech equipment remains high. Numerous steps are taken to reduce power consumption, such as the introduction of LED light bulbs in the Paranal Control Room, but with some natural limitations. Therefore, only renewable energy can be a real step forward to make the observatory independent from fossil energy: photovoltaics, wind energy and solar thermal solutions have the potential to be implemented in the future and is essential to make this economically attractive. One of the small but significant initiatives is the new, more modern laser guide star system that has been installed at Paranal, effectively reducing the power consumption to less than a tenth of that required by the old laser. This is naturally only a small fraction of the observatory’s power consumption, but since more lasers are planned for the Very Large Telescope in the near future, and on the Extremely Large Telescope (ELT) in the medium term, it is an important step. Ongoing improvements at Paranal include the recycling and management of hazardous and difficult materials (batteries, chemicals, oil etc.) and the monitoring of food waste. In the future, the site aims to reduce and eventually eliminate the plastic bottles used to dispense water throughout the facility, in order to prevent waste. A similar endeavour is already ongoing at La Silla. Green energy is strongly supported by the Chilean government, which aims to increase the Chilean green energy component to 25% in 2020, with a possible target of 30% by 2030. This will improve the energy mix. Over the years, ESO has managed to successfully reduce its power consumption at La Silla. Future plans include the introduction of LED lighting throughout the La Silla facilities, as well as motion sensors for lights at La Silla Hotel. A solar farm has been built and installed at La Silla, effectively exploiting solar energy by the use of crystalline photovoltaic modules (solar panels) in a project initially run by the Chilean company, Astronomy and Energy (a subsidiary of the Spanish LKS Group). That company has since been acquired by the Enel Group. Enel Green Power (EGP), the Enel Group company dedicated to the international development and management of renewable energy sources, completed the solar farm project with ESO. The modules now cover an area of more than 100 000 square metres on the site. ESO’s sites offer astronomers more than 320 clear nights per year; the clear daytime sky also provides abundant sunshine. But only very recently, however, the much-improved efficiency of solar cells has meant they have become a viable alternative to exploit solar energy. Solar cells of the latest generation are considered to be very reliable and almost maintenance-free, characteristics that contribute to a high availability of electric power, as required at astronomical observatories. Ongoing improvements at La Silla include reductions in the use of plastic water bottles for water dispensing, compost produced from organic waste, the use of more efficient diesel vehicles for commuting, and solar thermo-panels for heating water. ESO has implemented recycling containers in its main and satellite buildings at Vitacura for the recycling of glass, cardboard and paper, plastics, batteries and more. Rainwater is collected in a water well and this natural water is used for watering the park, which is extensive with thousands of plants, trees and large grass areas. In the future, ESO has many ideas for green initiatives that will help to make its facilities more environmentally friendly. For water conservation, these include a treatment plant for sewage and purification plant to make tap water drinkable. Solar thermo-panels for heating water, such as those already in use at La Silla, can be made more widespread, which will help to reduce the cost in energy. With regard to the buildings themselves, future constructions can be designed specifically to be green from the ground-up, while existing buildings can undergo a retrofit to achieve improvements. Such initiatives could also include more “intelligent” heating and lighting systems that automatically switch off when not in use, as well as more efficient appliances to optimise energy use in kitchens. 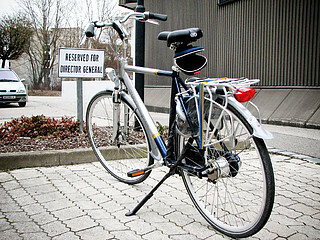 General emissions can also be reduced by encouraging employees to only make long-distance trips if essential. Telescopes are in Service Mode, while virtual access can allow astronomers to work remotely.